← >Leftover catchups to date…! Awoke with the sun literally streaming through my bedroom window, bliss, baked me like a greenhouse. Luisa was awake but lay with me smiling at the promise of Summer at last. Cornflakes, cold milk, Alta Rica decaff coffee… lots of lovely things today. Lunch and dinner were both by Amy soft; lunch was roast chicken and Branston pickle on fresh granary bread with a side salad and dinner was a scrummy potato bake with brocolli, more fresh cut bread and proper butter. ~sighs happily~ Today’s food was – as they say in internet-land nowadays – made of nom! I went to good old Morrisons for our food shopping and spent a hundred pounds; frightening how quickly it goes when you run out of everything in a household as busy as ours. 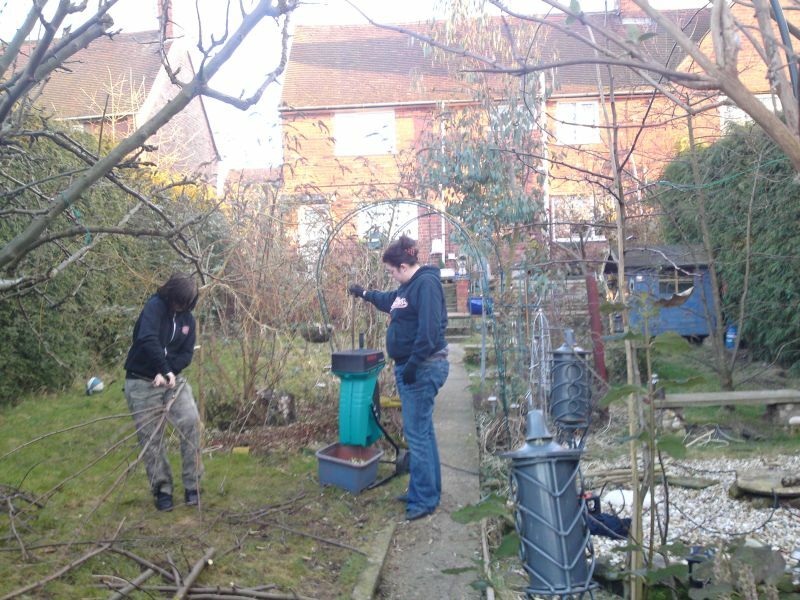 Then the rest of the day was spent by all of us in the garden… look! 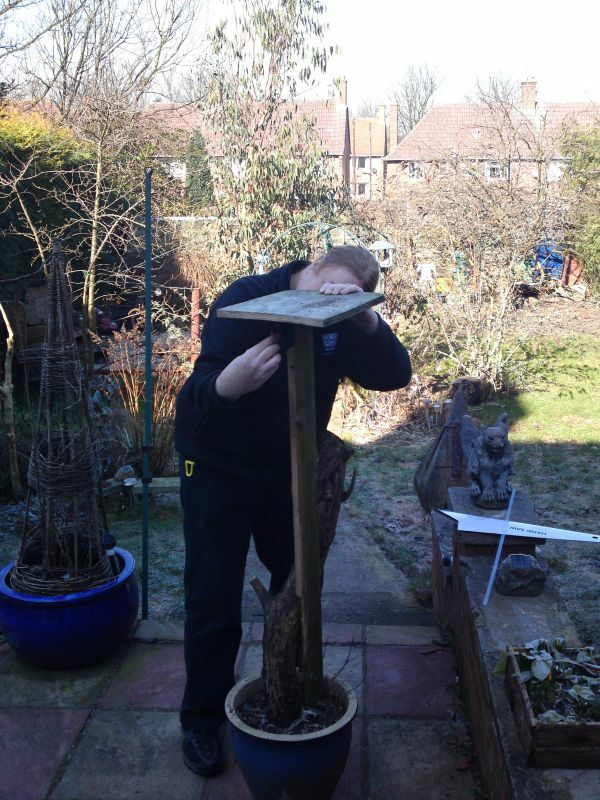 Despite the amazing sunshine through windows/greenhouse effect, outside it was still briskly cold and icy. 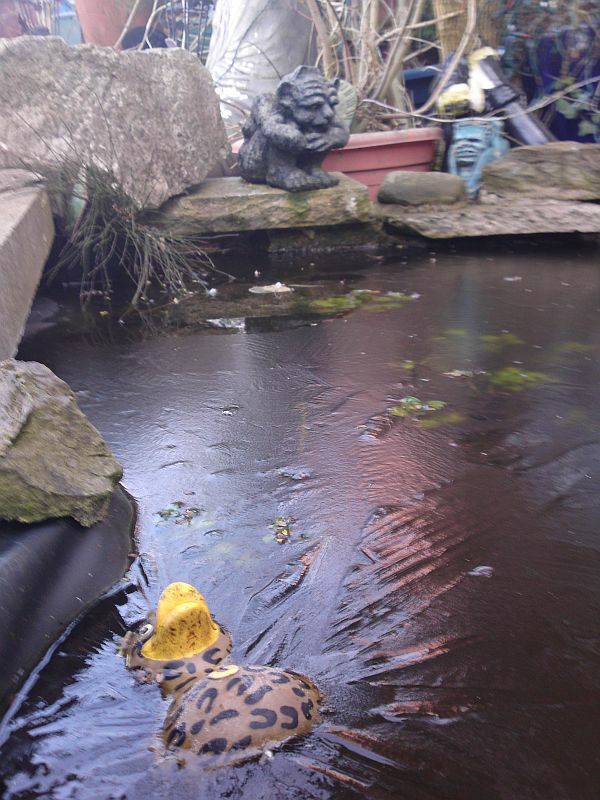 The pond was even frozen; look at the little leopard print duck stuck in the ice on his back! Mummy brought that for a fun present some years ago now. I love the gargoyles all over our garden. 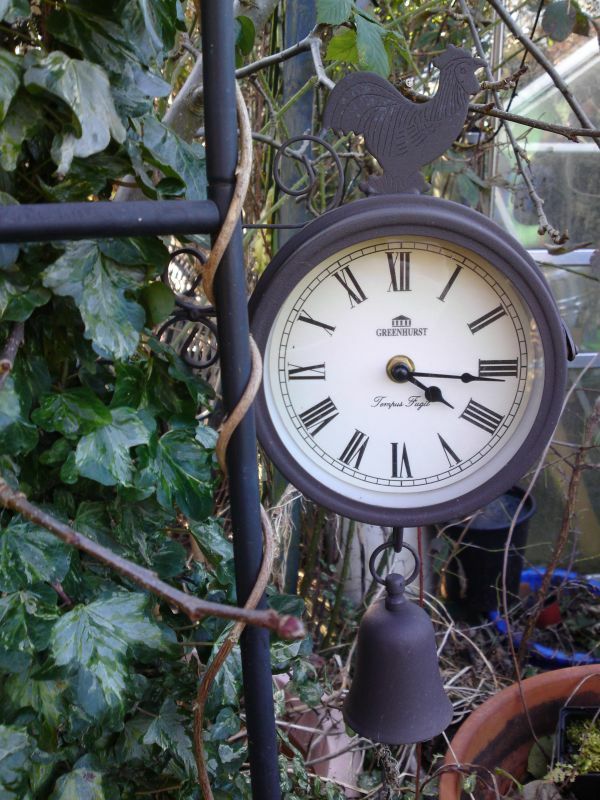 Purely gratuitous picture to post, I love this clock Rachel put up on the ivy covered post (affectionately known as George, because we used to fence with him with our Italian Rapiers for practise…) at the bottom of the garden. Isn’t it handsome? Rachel spent hours today making this for me. I sit at the dining table in my living room on my laptop, looking out of the window but at an angle so there’s only so much of the garden I can see from here. I wished I could watch the birds who eat scraps from the tree by the pond, so she lovingly took it upon herself to build me a bird feeding station to put right outside my window! Here she is busy beginning the project. It’s set in concrete in that blue pot! 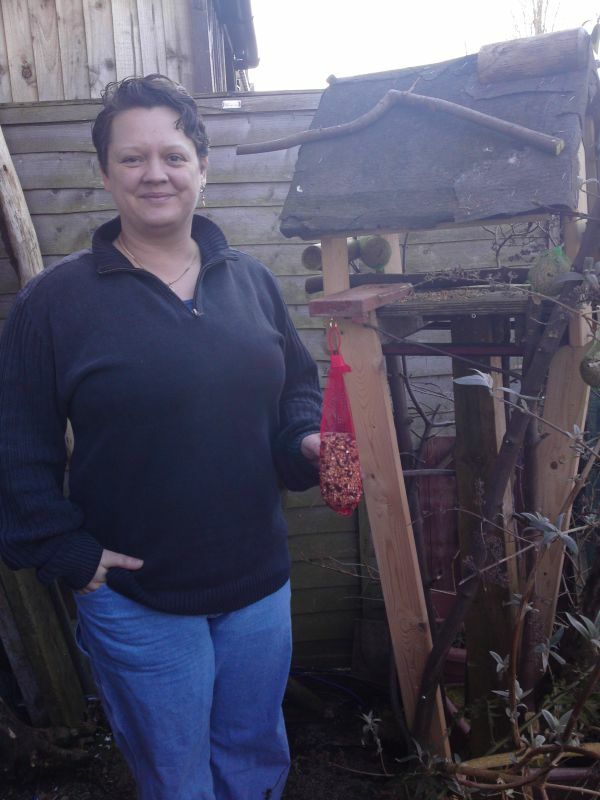 Here’s me stood proudly with my wonderfully artistic bird table completed! Rachel was proud that it only cost a pound in nails/screws but all other materials were recycled. 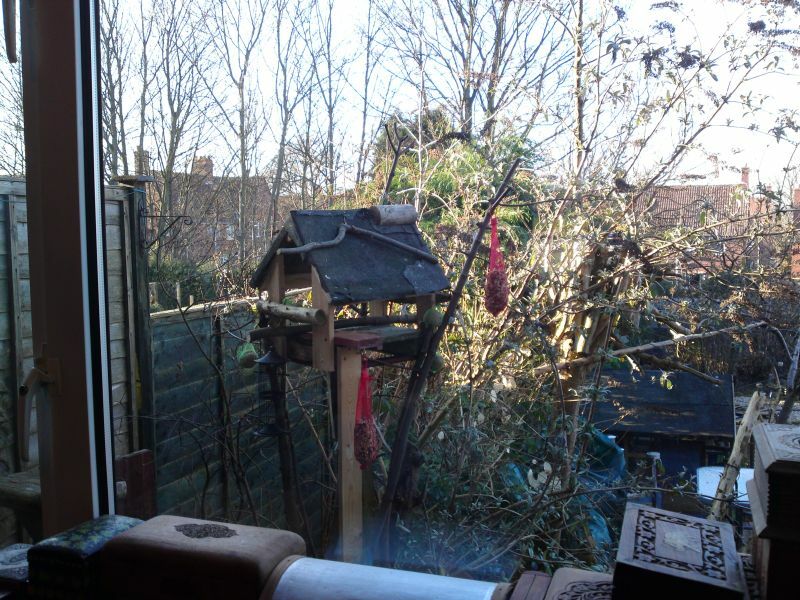 And here’s the view of the bird feeding station from my living room window; isn’t it grand? Note my ‘box fetish’ in the windowsill, I assure you that you can only see a very few of the total on that shelf! 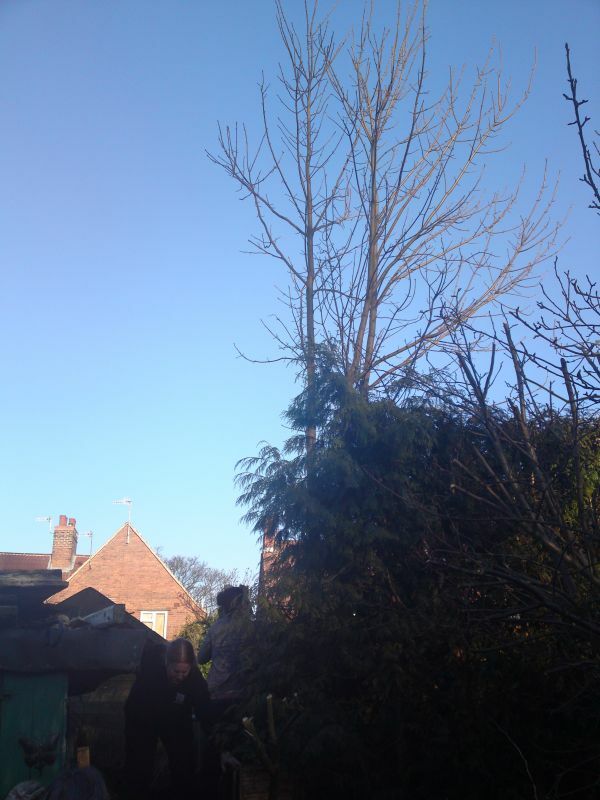 Here at the bottom of the garden, at the end of our ridiculously tall Lelandii hedge (great for privacy), is the even more ridiculously tall Sycamore. We’d promised a neighbour (whose greenhouse these overshadow/overhang) that we’d have these taken down but finances being as they are for everyone we decided to take matters into our own hands. What mad fun that was. 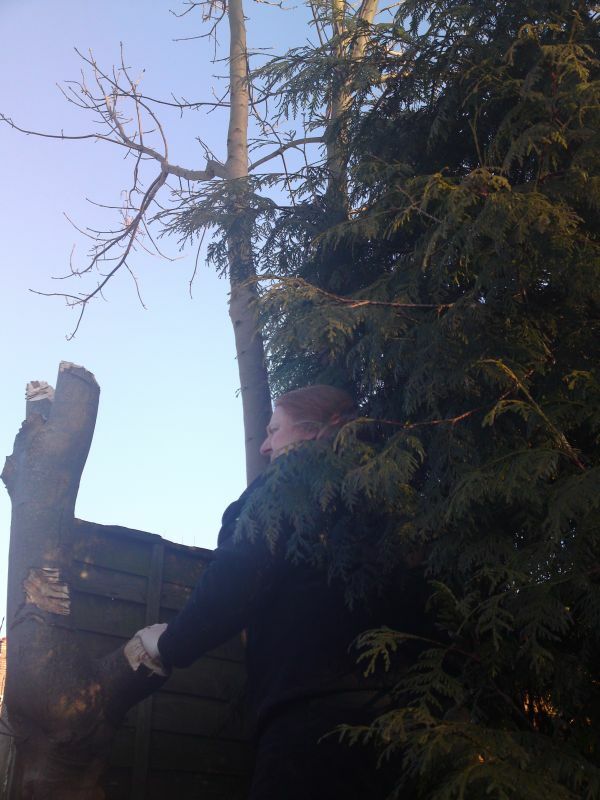 Our chainsaw broke awhile back and we hadn’t got around to replacing it, so it was down to planning, axe chopping and rope pulling! 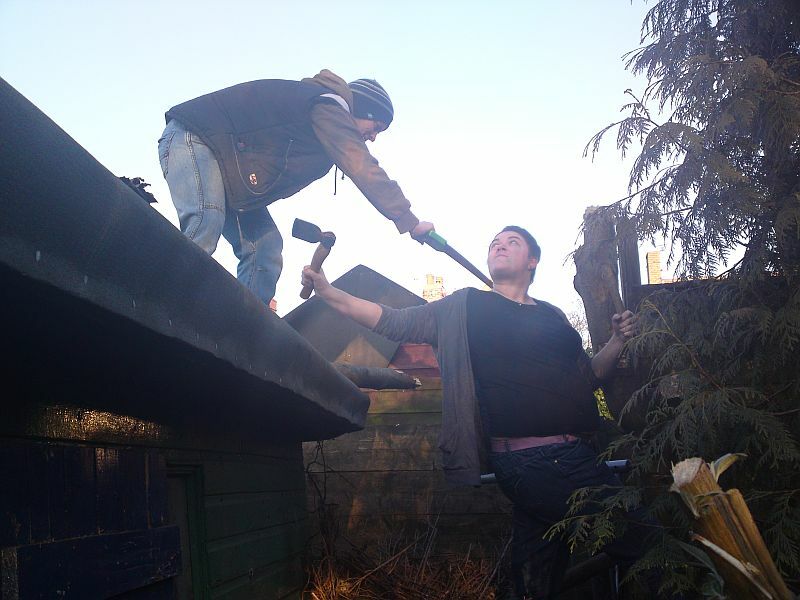 Team work or what. 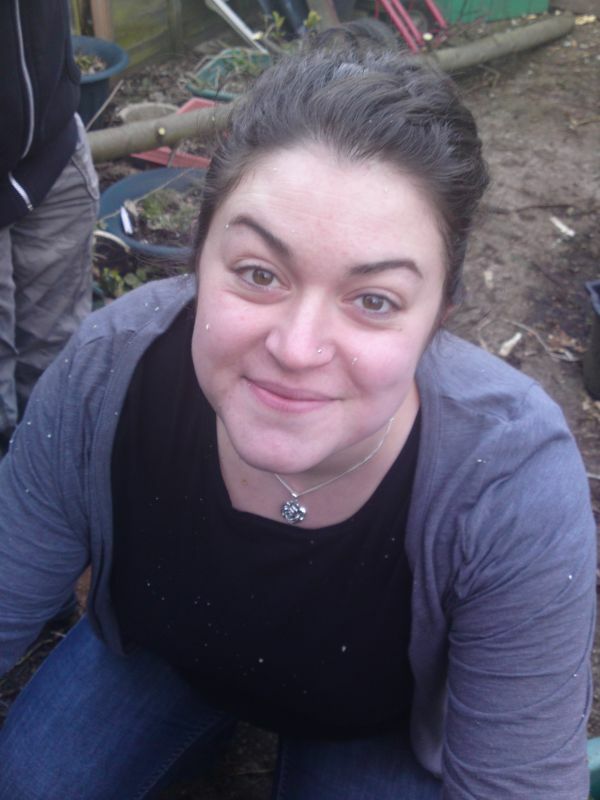 Here’s Rachel looking thoughtful, surveying the land and planning the mission. Note the first one they took down last weekend that she’s leaning on. 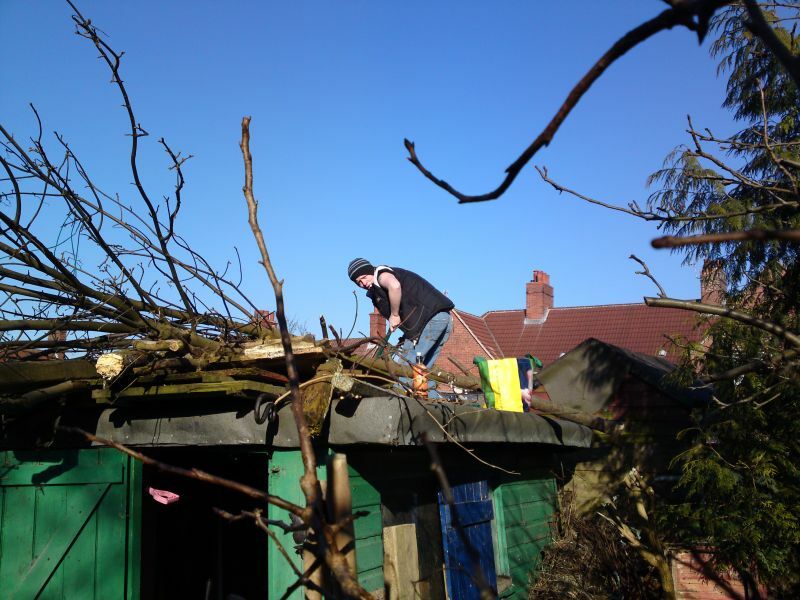 Tom-boy spent half the day on the large shed roof sawing, lopping and chopping down the big bits of tree into burnable wood for the woodshed. 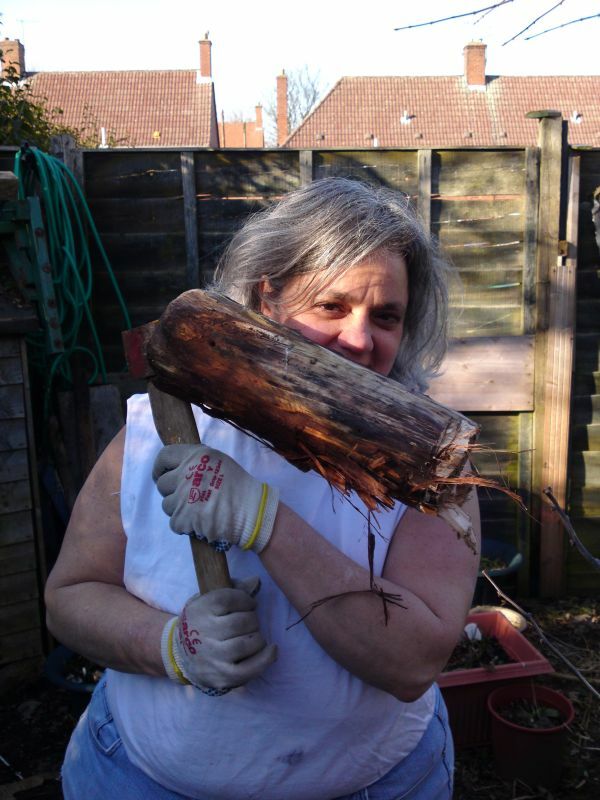 Here’s Luisa posing with her enormous log splitter (my Yule gift to her!). Size queen! …and here she is again with it embedded in a log she was trying to split! 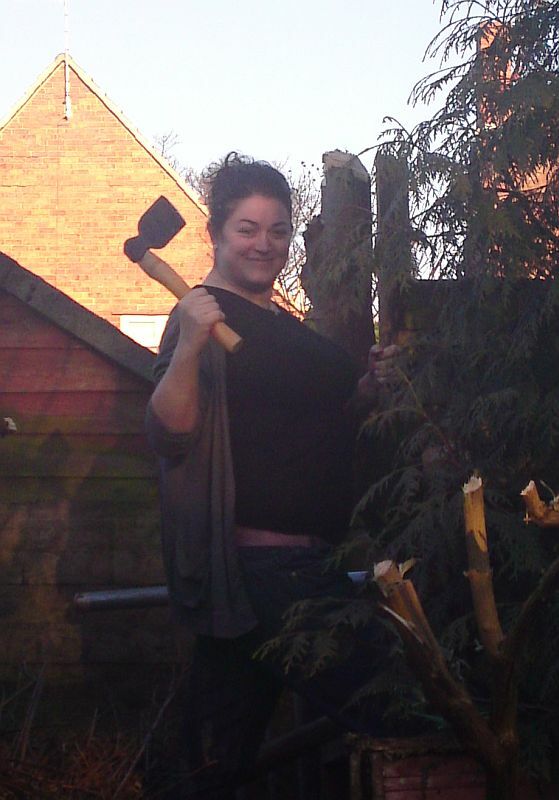 Here’s Amy after her bit of tree chopping, covered in sawdust! 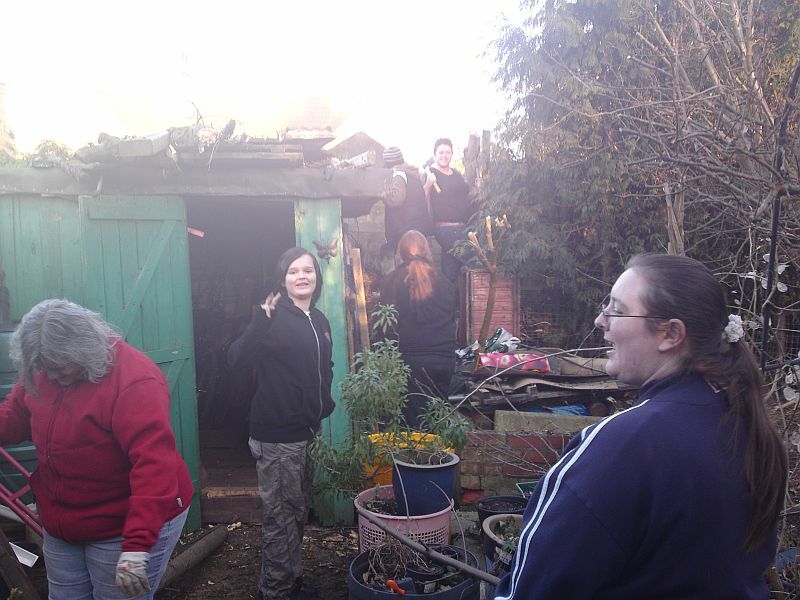 Everyone got involved; here’s Luisa, Lina, Rachel, Tom-boy, Amy and even Andrea came over and got stuck in helping! 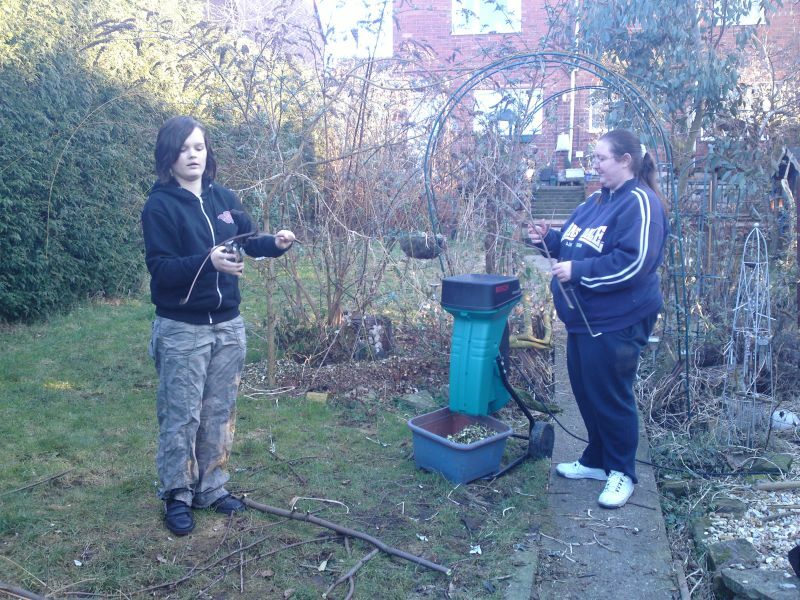 …and here’s Lina still hard at work whilst Andrea feeds the chipper. I doubt it’ll be a late night tonight, all that fresh air and physical work pooped everyone out, I’m literally the last man standing! Speaking of which ~yawns~ …that’s all for tonight.